Their eyes glow red in the dark, and tiny fangs protrude from their mouths. They may sound like creatures in a movie, but "monster reborns" are ending up in the arms of people all over the world. WASHINGTON – Their eyes glow red in the dark, and tiny fangs protrude from their mouths. They may sound like creatures in a movie, but “monster reborns” are ending up in the arms of people all over the world. 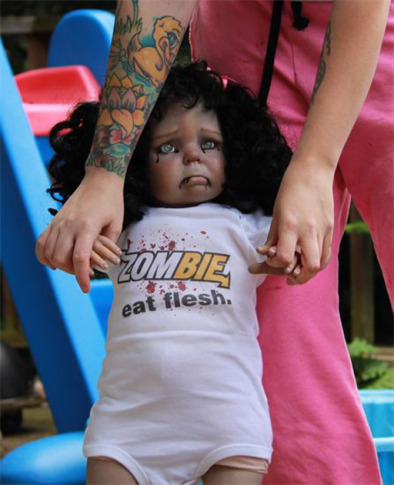 “People call up and ask for either vampire baby or they want a zombie baby,” says Bean Shanine, who is producing the monster babies from her shop in Bellingham, Wash. The reborn craze starting in the early 1990s with people buying reborn kits on websites like eBay. The kit contains all the material needed to create a realistic looking newborn baby, including synthetic body parts and paints. Shanine’s company, The Twisted Bean Stalk Nursery, specializes in the reborns — with a twist. Shanine is one of a handful of reborn artists who are catering to the “Twilight” and Zombie craze, offering babies with glowing eyes, sludge-filled mouths and tiny fangs. Since Shanine began making the dolls two years ago, her growing business has gained a worldwide audience. These creations don’t come cheap, with prices starting at $650 and running into the thousands. Her Claudia doll creation from the 1994 movie “Interview with the Vampire” sold for $2,500.